El Chapo's wife, former beauty pageant winner Emma Coronel Aispuro, showed up to court on the first day of her husband's trial. On Tuesday, Nov. 13, 2018, the New York Post reported that Aispuro arrived to a Brooklyn courthouse that same day. The publication noted that she dressed up for the trial, wearing "a suit jacket with puffy velvet sleeves, black suit pants and black stilettos." 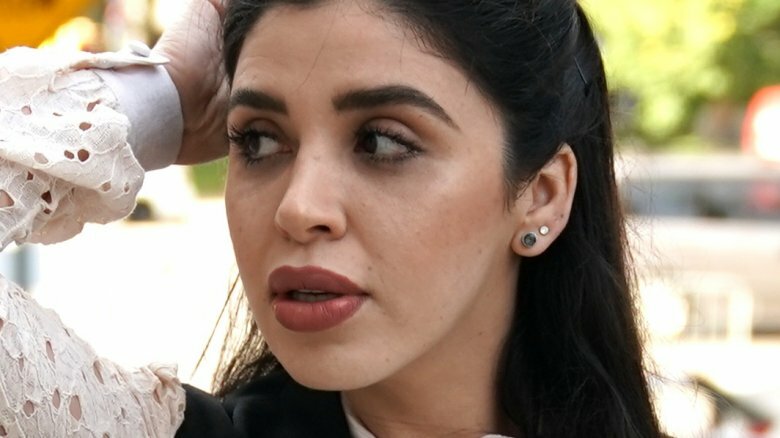 Aispuro was reportedly startled when a police dog sniffed her leg outside the courtroom, but, once inside, she was said to have smiled and waved to Joaquin "El Chapo" Guzman Loera, a Mexican man with reputation as a suspected drug cartel boss and murderer. Though she was reportedly provided with translator headset, Aispuro removed the headset when prosecutors started reading the long list of charges made against her husband, according to the New York Post. However, the 29-year-old reportedly spoke to "an associate" at various moments. CNN has called Guzman's trial the "most significant criminal trial in decades." Guzman is accused of "international drug trafficking, conspiracy to murder, [and] gun and money laundering charges," as reported by CBS News. He has pleaded not guilty to the charges. If found guilty on all charges, he could be sentenced to life in prison. Speaking to CNN, Bruce Bagley, an expert from the University of Miami with knowledge of drug cartels, said that Guzman helped turn the Sinaloa cartel into one of the most organized crime groups in the world. Calling him an "equal-opportunity corrupter," Bagley said, "He was willing to pay million-dollar bribes or even more — going from the municipality to the state up to the federal government." According to the New York Post, federal prosecutor Adam Fels used his opening statement to address some of Guzman's alleged crimes, noting that he was thought to have ordered the deaths of his rivals. "He ordered his hit men to locate, kidnap, torture, interrogate, shoot and kill those rivals," Fels stated. "Not even Guzman's own family members were immune." 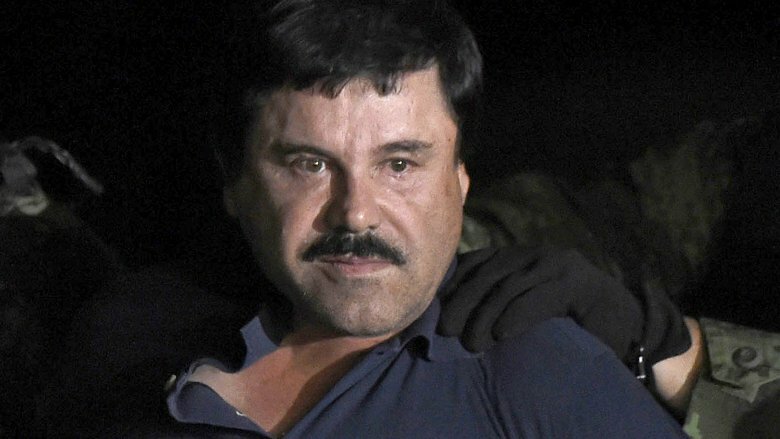 However, Guzman's lawyer, Jeffrey Lichtman, argued that the prosecution had fallen for the "myth of El Chapo," and alleged that his client was simply being used as a "scapegoat," as reported by The Guardian. According to CNN, Guzman's trial will rely on testimonies from over a dozen witnesses, some of whom are former associates who are currently imprisoned or are people who were given new identities and relocated under protection of the United States government. Guzman has been imprisoned before, but he's known for escaping. While in a Mexican prison serving a 20-year sentence for "criminal association and bribery" in 2001, he reportedly was able to escape by hiding in a laundry cart. He was later captured in 2014, but he's said to have escaped a year later via a hole in his prison cell. After being found again in 2016, he was extradited to the U.S. and has since been behind bars in solitary confinement in a Manhattan prison. Guzman's trial, which will reportedly have tight security, is expected to last four months, as noted by CBS News. While Guzman has been locked up, his wife has reportedly been showing off her wealth and her expensive taste in Mexico. As reported by the New York Post, Aispuro has been photographed on the beach multiple times. She's also been seen wearing skinny jeans with stilettos and a Prada purse and often has her makeup perfectly done. Guzman and Aispuro previously met at a party thrown by her father, Ines Coronel Barreras, who is a reported member of the Sinaloa Cartel. Guzman and Aispuro later married on her 18th birthday on July 2, 2007. Guzman reportedly help her secure her crown as Coffee and Guava Queen in Sinaloa not long afterwards. In another display of her wealth, Aispuro, who was born in the United States, reportedly threw an extravagant Barbie-themed birthday party for her and Guzman's 7-year-old twin daughters, Emaly and Maria Joaquina, in September 2018. Aispuro was photographed posing in front of a life-sized Barbie palace that had been made for the occasion. Guzman's other children have also reportedly enjoyed lives of luxury as their father has been in prison, as two of his sons Jesus Alfredo and Ivan Archivaldo — who are both wanted for alleged drug trafficking — were seen driving Audi Spyders, which cost over $220,000.